These last 100 days have taken us through England, Norway, Belgium, France, Portugal, Hungary, Croatia, Slovenia and now Turkey. It has been the busiest leg of our trip and we are both feeling it in different ways. We have neglected our philosophy of slow travel to try and see as much as we can before the end of the year. Our trip is in its winding down phase and it is amazing to think we have already been away from the States for 300 days. It is also just shy of a year from when we quit our jobs and left California. We land state-side in Fort Lauderdale on December 15 after a 14-day cruise from Rome so I am sad to report there will likely not be a 400 day post. After almost a year on the road, here is our latest installment of reflections. You can also look back at both 100 and 200 days of travel to catch up. Enjoy! Jill: We found Taberna Da Rua Das Flores in Lisbon through this great food blog called Purple Foodie and it did not disappoint. Likely one of the tastiest, most reasonable meals we have had on our entire trip. Oh, I have also indulged in just a few hundred sweets and local pastries as we have traveled through Europe. Too many too list as favorites. The pastel de natas at Pasteis de Belem in Lisbon. Dave: We had a barbecue on our sail boat in Croatia one night. It was a meat-lovers feast. I probably ate 30 chicken wings and countless numbers of ćevapčići (a type of minced meat kebab). The main condiment in Croata is ajvar (an eggplant/red pepper spread) and together with the ćevapčići is just brilliant. Jill: All the belgian beers we tasted while in Belgium. Yum! Dave: I’ve said it many times before, but I’m impressed with the wines in places you wouldn’t think would make good wine like Hungary and Croatia. However, I can’t even say we’ve had the best of what those countries offered since we haven’t really bought any bottles over $10. Probably a mistake. Jill: Europe - lets have a quick chat - PLEASE GET RID OF NESCAFE! While we discovered Nespresso in Europe, which is heaven in an espresso cup, we have had way too many cups of Nescafe instant coffee. The coffee shop craze that is all over the States has yet to really catch on in Europe. Good coffee is definitely one of the top things I am looking forward to when getting home. Dave: Sludgy loveliness at a Turkish coffee house. A little thick, but delicious. Jill: It was not in a small tent for four nights at a music festival in England. Our tiny tent in the camping field at End of the Road. Dave: For some crazy reason I actually did well in that tent a couple of nights. I don’t sleep well to begin with so the problem is usually me, not where we’re staying. It does get a little old going from one place to the other and having pillows and mattresses of varying quality and noise quirks of each place that take a day or two to get used to. Jill: The London Eye, while expensive, was a fun experience and well worth the money since we had a clear day. It was even more fun being on it with our nieces! Dave: Wow. Too many to come up with just one. I’m not typically one for touristy things, but the ancient artifacts and mosques we’ve seen in Turkey have been pretty cool. The beauty of Croatia and Slovenia stood out as well. 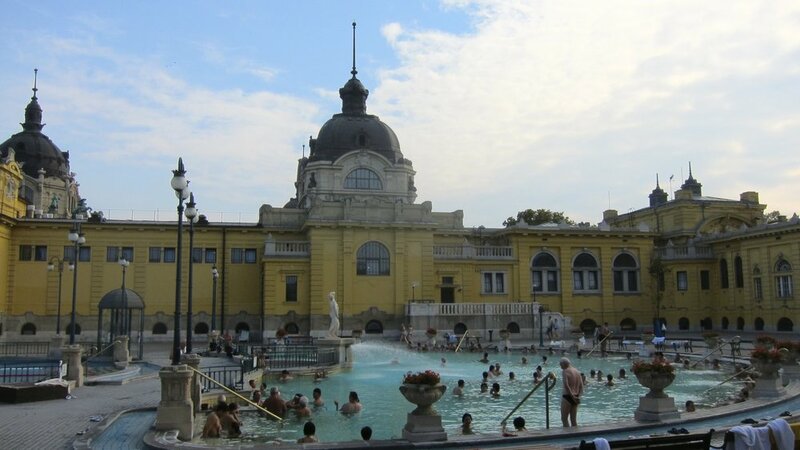 But I absolutely loved the day we spent at the Szechenyi Thermal Baths in Budapest. Jill: My favorite active adventure was our three-day hike along the Rota Vicetina in Portugal. It was challenging, beautiful and a great change of pace during our overall trip. Camping out at a music festival at the End of the Road in England was also an adventure of a different sort (hello no showers and port-a-potties for four days with thousands of my closest friends). Dave: Eating is often an adventure, though not always the best kind. I’d have to say it was our 55-kilometer bike ride in Croatia. It was about as long as I’d ever ridden and I smoked my Austrian counterparts going up the ride’s steepest hills. It made it worth all of the hours and effort I spent climbing the hills behind our old place in Oakland. Jill: We had the opportunity to reconnect with a number of people while in England. Our brother, sister and nieces came over from the States to meet us, we saw friends who volunteered with us in Cambodia who live in England and one of my favorite co-workers and friends from California moved to London right as we were visiting. It was a lot of fun and so nice to have some friends again. Besides that, my fondest memories are at afternoon tea with Beth, Anna and Sloane and experiencing life at a multi-day festival at the End of the Road. We really had a bloody good time in England, although it was our least exotic experience this year. Dave: I’m going with Least Favorite England Memory. After spending time with my nieces and having a great time Jill said to me something like, “Looks like they were more interested in hanging out with me than you. They’re not little kids anymore, they’re becoming women.” And it was true (well, when it comes to making bracelets and going to afternoon tea). I do still think of them as little kids so I’m having a tough time moving on. Jill: The fjords in Norway are just amazing and it was really special to share the experience with Dave’s parents. We did a great hike in Geiranger that took us high above the fjord where the views were spectacular and we had it all to ourselves. It also was a hike where we shared the trail with sheep and llamas - always a fun adventure. Dave: The unbelievable beauty of the fjords of Norway, taking home the kayak gold for Cambodia, relaxing on the ship with my parents and seeing all of the cool statues in Vigelandsparken Sculpture Park in Oslo. Jill: Belgium was all about food and beer for us. Our meal of mussels and fries at La Bonne Humeur in Brussels was delicious, fun and one of my favorite Belgium experiences. Dave: Walking into a beer shop with the most amazing selection of Belgian beers and just feeling my eyes expanding. Jill: We did one of our best bike rides in France - along the velo route through Burgundy wine country. The path takes you through many of the famous Burgundy vineyards and the scenery is just magical - riding along the vineyards and into small village after small village. Oh, and we got to wine taste along the way. A winery in Alsace, pouring their Cremant for us. Most Cremants went for under 10 Euros! Dave: Our crepe taste-off in Paris was pretty cool. As was watching the Bears beat the Vikings at the house of a friend who lives in Paris. The most surprising thing was how affordable we could find really nice wine in both Alsace and Burgundy. Oh, and speaking (a little) French was fun. Jill: Just being in Portugal was enough for me. I loved everything about it and it was a country that lived up to all my expectations. Hiking the Rota Vicetina was a highlight along with seeing a few friends in both Porto and Lisbon who made our time there that much better. The pastries in Portugal are also pretty delicious. Dave: Seeing my Cambodian friend Samath in Porto and my Chicago friends Andy and Tracey in Lisbon. But nothing on the trip may top our three-day hike along the coast of Portugal. Jill: Budapest blew me away. It is one of my favorite cities we have been to on this entire trip. My favorite day was our afternoon spent at the Szechenyi Thermal Baths. Beautiful buildings and warm pools at the baths in Budapest. Dave: Finding beer made by a brewery called Hopfanatic and going to the new bar they opened in Budapest. A bit of a dive, but my kind of place. Jill: On our cycling and hiking sailing trip, we had one dinner on the ship that got a little out of hand. Lots of Austrian singing, stories and far too much drinking. I rarely knew the songs until they started a yodeling song similar to the puppet show scene in The Sound of Music. I could keep up with that one and it was just silly fun. Dave: Watching in horror as someone mixed red wine with orange Fanta soda. We soon learned it’s a common drink called Mish Mash. Jill: I had no idea what to really expect in Slovenia, but it was a place I quickly fell in love with. Besides eating my fair share of Bled cream cake while staying in Lake Bled, I was amazed by the turquoise water rushing through the Vintgar Gorge. I was in my special place walking along the trails and boardwalks through the gorge. Dave: Just its overall beauty. Jill: Here is the Turkish secret for pure bliss - a Turkish hammam (or Turkish bath). More to come on this experience in a future blog post, but when you respond to the person “cleaning” you that it is the “best day ever” then it has to be a favorite memory. Dave: Listening to the Call to Prayer that is broadcast from the mosques in every city you visit. Really beautiful prayers. The relics in Istanbul and Ephesus have been pretty cool as well. Outside the Great Theater in Ephesus. Jill: A few years ago for Christmas, my sister gave me one of those small, flexible leg tripods for my camera. I brought it with on a whim and it has come in handy on numerous occasions when Dave and I want pictures of both of us and there is no one around to help us. Dave: I almost didn’t bring my pair of Ecco sandals since they’re a bit heavier than a typical sandal and I was already bringing flip flops. Turns out I’ve worn them more than anything else. Also, we bought monthly access to the Spotify music service and it’s been a godsend since we were tired of the downloaded music we had. Jill: By this point of the trip, I have gotten rid of most things I didn’t need. I did send home our small water purifier a few months ago since we were going to be traveling through developed countries for the remainder of our time. I think I still have too many clothes with me, but it is nice to have some variety. Dave: My toiletry bag has been the heaviest thing I’ve carried and it hasn’t gotten much lighter. Too many razor blades since I only shave a couple of times a week and some medicines that I may have needed, but haven’t gone through, multiple pairs of contact lenses, extra toiletries I thought I might not be able to purchase along the way have all added up to unnecessary weight. Jill: In Norway, one of the most expensive countries in the world, I bought a new pair of jeans. My original pair had become too big and I was almost walking around like a teenage boy with his jeans around his bum. I paid a little premium to buy a new pair in Norway, but it has been the best purchase so far. That along with my Prince George Whole Foods bag from London. Dave: Pistachio nuts in Turkey!!!! Dave: I still wake up excited every day that Jill is still around, but it would be nice to talk to someone else every once in a while. Jill: It is true, traveling with one person for a year is not always easy. We have gotten along well and enjoyed being with each other for this long, but we are looking forward to coming home and being around friends and family for a while. We did not do the best job of finding our own space while on the road, which is something I would recommend to anyone embarking on this type of trip with their partner or a friend. But, that being said, we are extremely lucky to have had this time together to learn more about each other and create amazing memories.